I’m really excited by my new gin safari – which I test ‘drove’ – feel something wrong about mixing my drink, driving and metaphors! but anyway I did with a friend Jude last Friday. 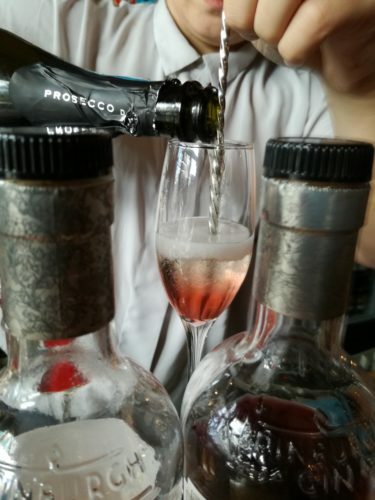 We started with a choice of four Edinburgh Gin liqueur; elderflower, rhubarb and ginger, raspberry or plum and vanilla, then fizz is slowly added. Delicious. Then The Marshmallow Lady had devised a special gin and tonic themed marshmallow for us, then a lovely gin-tinted stroll through The New Town for a Pickerings gin-cured Shetland smoked salmon – what a way to go – absolutely delicious. Then to Coco Chocolate for a gin and tonic chocolate bar and we ended up at Last Word – such a cool gin joint for a Caorunn gin and Feverfew tonic with a apple garnish.